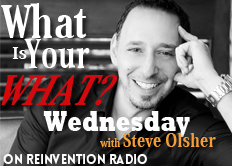 Steve reflects on a quote from Neale Donald Walsch that is similar to his own of “life starts over right now, and again right now.” He asks of the Reinvention Radio crew to share their thoughts on making a conscious choice to live in the moment. Why do you believe life constantly starts over? Do we have any control over our conscious mind of what happens in our lives?